Opposing teams stopped short of draping white towels atop their hockey sticks and waving them in the air before squaring off against Bloomington Jefferson during the 1992-93 season, but there was a certain “understanding” by all parties as to how the game was about to play out. The Jaguars were a fighter jet squaring off against crop dusters. The outcome was crash-and-burn inevitable, and everyone knew it. Gary Stefano was coaching at Park Center that season. He brought his team into the Bloomington Ice Garden for a regular season game against the undefeated Jaguars, who were coming off a state championship season in which they lost two games. Stefano wasn’t so much concerned about beating Bloomington Jefferson as he was keeping the game from getting out of hand. After the state tournament and before his team’s postseason awards banquet, Stefano fulfilled his promise and had his top cropped. Park Center had, after all, provided the Jaguars with one of their few close games all season. Bloomington Jefferson won its three regional playoff games by a combined score of 17-2 that season. The Jaguars were almost as dominant at the state tournament, steamrolling to a 14-3 advantage in their three games as they finished 28-0. Leading the way was senior co-captain Nick Checco, a first-line center who played with equal parts grit and finesse. 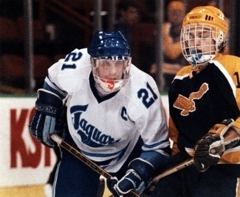 Checco had a goal and an assist in the Jaguars’ 4-0 win over Hill-Murray in the 1993 title game. He had two goals and an assist in a 4-1 triumph over Elk River in the semifinals. Checco said there wasn’t a lot of thought given to the implications of an undefeated season (no big-school team has duplicated the feat since) or the pressure of living up to such immense expectations. Starting when they were in grade school, Checco and his teammates spent all of their free time playing boot hockey in driveways or pick-up games at neighborhood rinks. “To this day we are all still friends,” said Checco, who lives in Eden Prairie and works in sales for Stryker Spine. 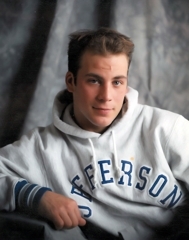 Checco was named Mr. Hockey after the 1993 state tournament, a tribute to his all-around play. “He was relentless forechecker, a hard worker, very unselfish,” Eden Prairie coach Lee Smith said. “He had good vision with his teammates, and he also was a good finisher. He played in all situations for them. Checco was never a top scorer for the Jaguars. That role belonged to teammates such as Joe Bianchi and Mark Parrish. Although he was an above-average skater, Checco did much of his damage with his body, throwing it at opposing players with abandon. Bianchi said Checco would become particularly physical when Bloomington Jefferson squared off against a team that had an acclaimed defenseman. “He made it very difficult for other teams to play against him,” Bianchi said. “Nick could flat out bury guys. He was a solid (5-foot-10), 5-11 in high school. Checco was drafted in the sixth round (137th overall) by the Quebec Nordiques in 1993. 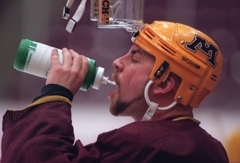 He played four seasons at the University of Minnesota, where he scored 34 goals and added 36 assists in 166 games. He played five seasons of pro hockey in the minor leagues, advancing as high as the AHL (one step below the NHL). Even as youth players, Checco said it was drilled into the future Jaguars that hockey is a team game. That meant goals and assists were irrelevant in the big picture.